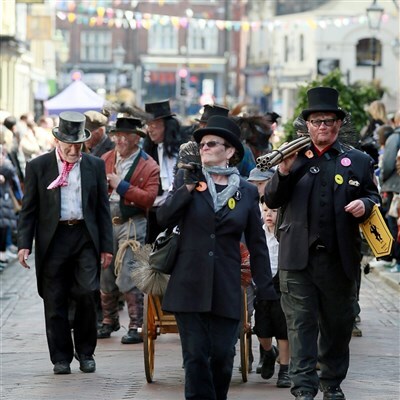 Revived in 1980, the festival sees chimney sweeps processing, dancing and singing through the city in an effort to raise money for the unpaid months ahead. It's where music from around the world meets traditional dancing in a colourful extravaganza of free entertainment. Rochester Castle Gardens will host a main stage with music throughout Saturday, Sunday and Bank Holiday Monday alongside a variety of attractions including artisan food and drink stalls, children's fun fair, folk art and psychic event and real ale and licensed bars. In Rochester High Street, there will be morris dancing and have-a-go pianos, plus three music stages, while in the castle moat there is storytelling and ceilidhs, or barn dances, for a spot of country dancing. The whole weekend finishes on Bank Holiday Monday when the festival procession sweeps through from Star Hill to the Castle Gardens at 2.30pm.